Art Taylor is president and CEO of BBB Wise Giving Alliance (BBB WGA) which verifies the trustworthiness of nationally-soliciting charities by completing rigorous evaluations based on 20 holistic standards that address charity governance, effectiveness reporting, finances, fund raising, appeal accuracy and other issues. Taylor has dedicated his career to charity transparency and accountability. Charity evaluations are available to the public at Give.org. In 2014, Americans hit an all-time high of charitable contributions. More than $350 billion dollars were given over the course of the year, from pennies dropped into jars to checks written in generous form. As a county, we should feel proud of our increase in attention, both in time and in money, to problems and issues in our world, and better yet, that we are taking action to engage in making a difference. The world today, though, is not always as honest and pure as we would hope. When making a donation, most of us assume- and understandably so- that the charity collecting donations or the person raising funds for a cause are going to be responsible and efficient with our contribution. Unfortunately, this is not always the case. Just recently, the FTC and states ruled to dissolve two fraudulent charities after they had swindled donors and broken trust with the public. It happens all too often. 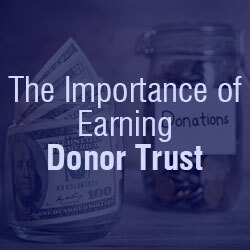 Trust and transparency are important to keep in mind whenever making any sort of donation, but these concepts become particularly important to those donors who may make large or recurring donations. So, how can you be sure that your generous donation is going to an organization that can be trusted? How can you be sure that will make the most of every dollar in order to achieve the biggest impact? Don’t go it alone – go to the experts. BBB Wise Giving Alliance (BBB WGA) is a standards-based charity evaluator that works to monitor and evaluate charities so you don’t have to. Based on 20 standards, ranging from charity governance, effectiveness reporting, finances, fundraising, appeal accuracy, and more, the BBB WGA evaluates more than 1,300 national charities. It is the mission of the BBB WGA to help donors making smart giving choices, ensuring their donation is being placed into trusted hands. Research your chosen charity. Part of BBB WGA’s mission is to provide donors with free, comprehensive reports that go beyond a financial report. BBB WGA monitors every aspect of a charity to make sure the organization is functioning honestly and transparently. The reports include the BBB WGA 20 Standards, and offer a threshold score for each standard, allowing you to make an educated decision as to whether or not proceed with your donation. Resist pressure to give on the spot. Whether it be a telemarketer, door-to-door solicitor, or ask at a fundraising gala, resist giving a donation on the spot before gathering all the details to make a wise giving choice. Be wary of heart-wrenching appeals. Less reputable charities may try to use emotional appeals to gain your dollar. What truly matters is what the charity is doing to help. Learn more about general giving habits and tips. Donors should feel confident in their donation and in their chosen charity. 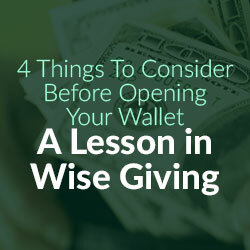 Check out tips on give.org and look for our tri-yearly issues of the Wise Giving Guide. BBB Wise Giving Alliance (BBB WGA) is a standards-based charity evaluator that seeks to verify the trustworthiness of nationally-soliciting charities by completing rigorous evaluations based on 20 holistic standards that address charity governance, effectiveness reporting, finances, fundraising, appeal accuracy, and other issues. National charity reports are produced by the BBB WGA and local charity reports are produced by local Better Business Bureaus – all reports are available at Give.org. Connect with us on Facebook and Twitter at @bbbgive for more wise giving tips and updates. How can charities build trust with the public? As donors become increasingly sophisticated, they look for factors that signal a charity’s trustworthiness beyond self-reported measures. Many charities show their commitment to transparency and accountability through third-party evaluation, giving donors the information they need to make decisions and benefiting the charity in the long run. On the flipside, choosing not to disclose information, or going nondisclosure, can have serious impacts on donor perceptions, signaling a lack of commitment to building trust, and placing a potentially ethical charity in the company of less scrupulous actors. Giving is a personal process. When deciding to give, donors automatically evaluate their closeness to an organization’s issue or cause relative to their values and ideals. At the same time, faced with uncertainty, donors want the security of knowing that an organization will put their money to good use. A 2001 BBB Wise Giving Alliance survey found that 70 percent of Americans said it is difficult to tell whether a charity soliciting their contribution is legitimate—that is, actually does the kind of charity work it says it does and operates ethically. Charities recognize the need to build trust with donors. On their own, they work to communicate their practices, goals, program accomplishments and finances. Yet, for many donors, access to this information is not enough. They seek a deeper, more nuanced picture, but may not have the time or expertise to evaluate what they see. Indeed, few donors know what indicators to look for within an annual report, audited financial statements or an IRS Form 990. At BBB Wise Giving Alliance, we help charities demonstrate their commitment to transparency and accountability and help donors verify the trustworthiness of organizations seeking their support. Working closely with charities, we publish reports based on the 20 BBB Standards for Charity Accountability. These standards were developed in an open process with significant input from charities, government regulators, donors, foundations and accountants, and cover a wide range of indicators. Beyond merely reporting financial information, they evaluate how well the charity is run, its fundraising ethics and whether it assesses the effectiveness of its programs. We currently report on over 1,300 nationally soliciting charities. In addition, 57 of the 112 Better Business Bureaus in the U.S. report on over 10,000 local charities. We do not seek ”gotcha” moments in our reviews; rather, we evaluate every charity’s policies and practices against our standards – a baseline for charity accountability. Once an evaluation is performed, we share a draft report with the charity. If a charity does not initially meet a particular standard, we provide a detailed list of suggested actions that would allow them to meet the standard before publishing the report, ultimately strengthening their practices and their organization for the long term. Despite the benefits, 35 percent of national charities in our database choose not to disclose information. When a charity opts not to disclose information in response to donor inquires, we publish a report that states the charity has not provided any of the requested information and we are unable to verify if it meets all of our standards. In our experience, going nondisclosure can affect donor perceptions. Seeing such a report sends a signal to donors that the charity has chosen not to invest in transparency and accountability. Most nondisclosure charities have nothing to hide, but a few bad apples make all nondisclosure charities look bad. In May 2015, the Federal Trade Commission and regulators from all 50 states and the District of Columbia filed a complaint against four cancer charities accused of deceiving donors and spending millions of donations for personal benefit of friends and family members of the organization’s leadership. While indicating that donations would go to “services like hospice care, transporting patients to and from chemotherapy session and buying pain medication for children,” donations were allegedly used to fund trips to restaurants, dating website subscriptions, trips to Disney World, Jet Ski rides and Caribbean cruises. 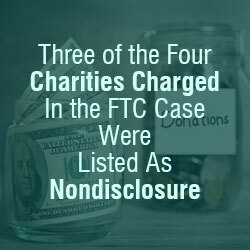 Three of the four charities charged in the FTC case were listed as nondisclosure and one had a report showing multiple standards as unmet or unable to verify. While we have heard many reasons for not disclosing, most organizations believe the benefits far outweigh the potential concerns. Some charities mistakenly believe that we charge a fee for reports when in fact there is no charge for accountability evaluations. Some charities are worried about not meeting all the standards. Others believe that obeying the law and publishing financials on their website alone is enough. Yet others have mentioned that they don’t want to divert time from fulfilling their mission, that their organization is too unique to be evaluated or that their donors know that they are beyond reproach. While a charity may not at first meet all standards, many find the review process useful in revealing organizational weaknesses and affirming areas where they are doing well, and follow our advice to help strengthen their organizations for the long term. 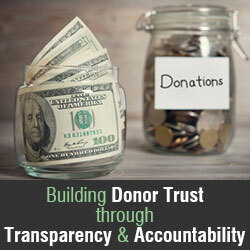 The donating public trusts BBB WGA to dig deep and get answers through its evaluations. In turn, we are committed to help them ensure they can trust the choices they make and give generously with confidence.